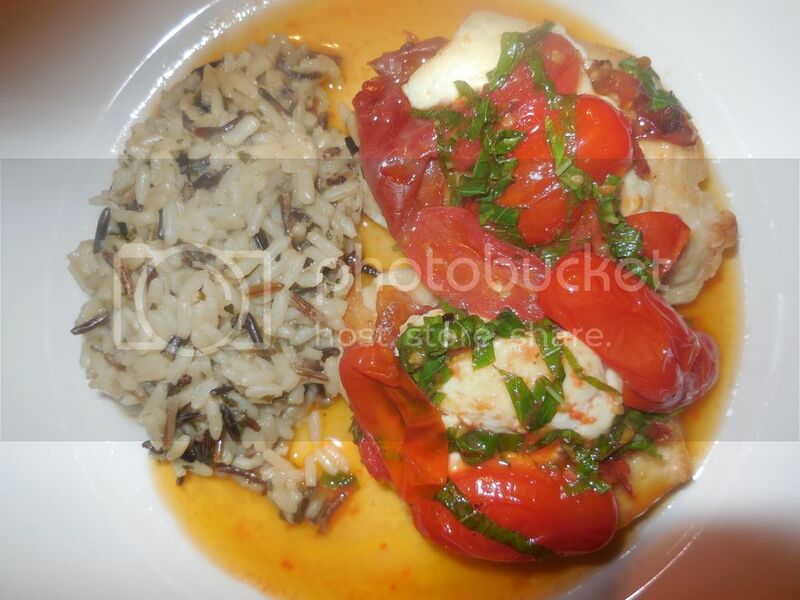 That chicken looks spicey...photo is very red...anyway looks delicious! Thanks, Lee. It was actually pretty mild but IIRC I did taste some paprika, which would definitely add to the color. 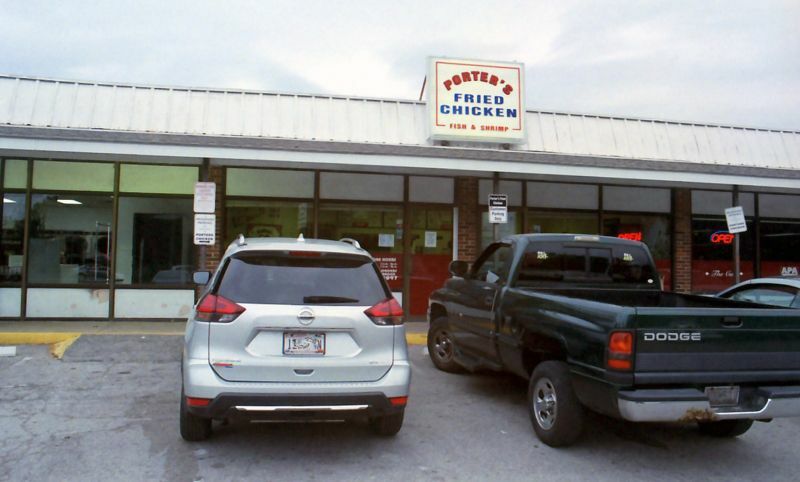 While in St. Louis for work I checked out a chicken spot that had been suggested by a couple of coworkers: Porter's Fried Chicken on Big Bend Road. 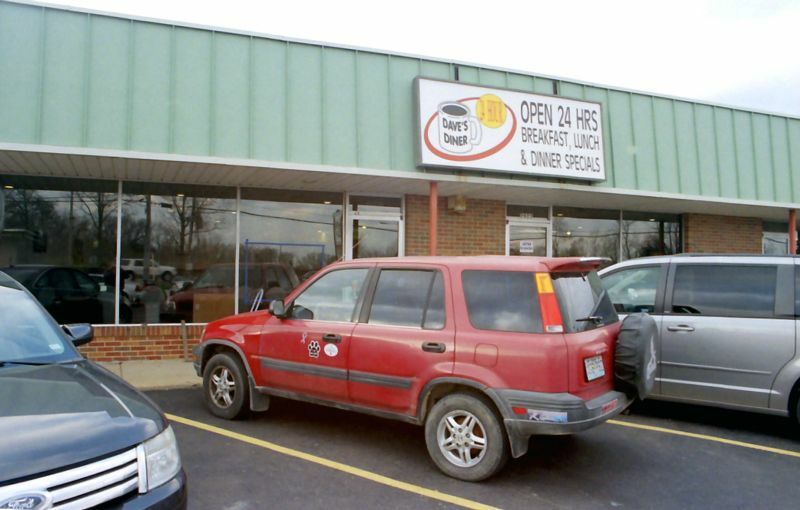 It's a small storefront in a small strip mall, and while most of the business is carryout there are a few tables for those who want to eat in. Porter's offers chicken with 2 levels of heat; the spicy chicken is on the left. It had a pleasant, not overpowering burn and I think I liked it better than the regular, which was very good in its own right. Porter's also has fish and shrimp on the menu so I added a few shrimp to my order. 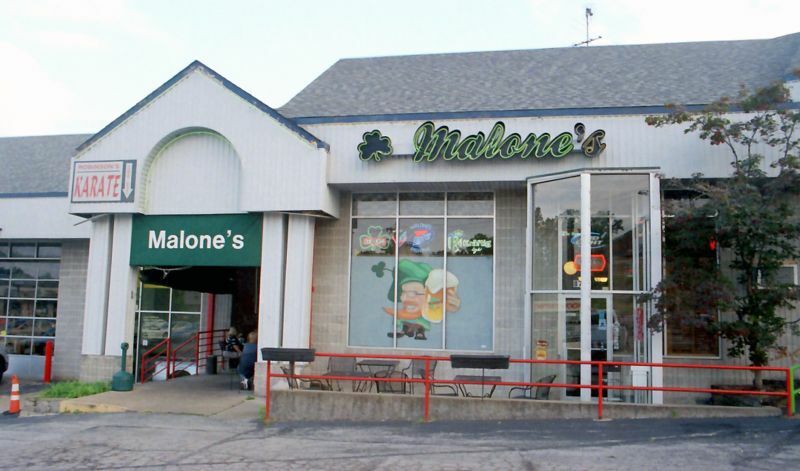 The next night we headed over to the Crestwood area for a visit to Malone's Grill & Pub, whose chicken recipe comes from the defunct St. Louis restaurant Romine's (closed 2006). 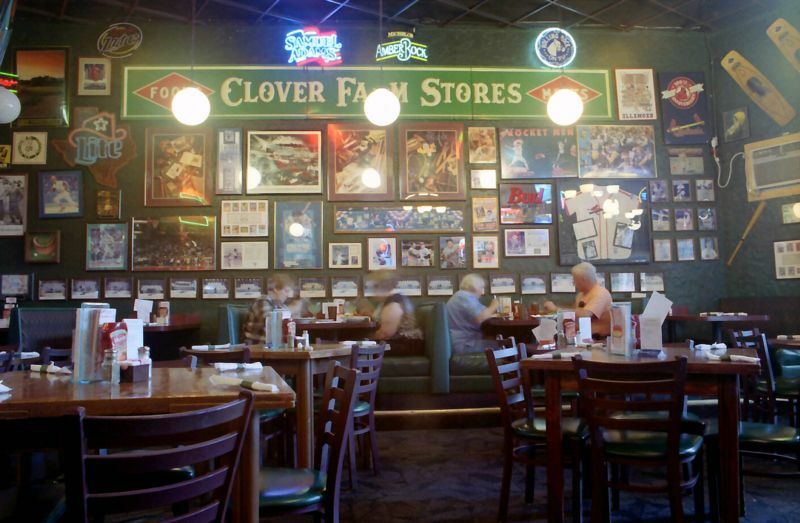 Many of the smaller photos that adorn the walls feature famous St. Louis sports figures. 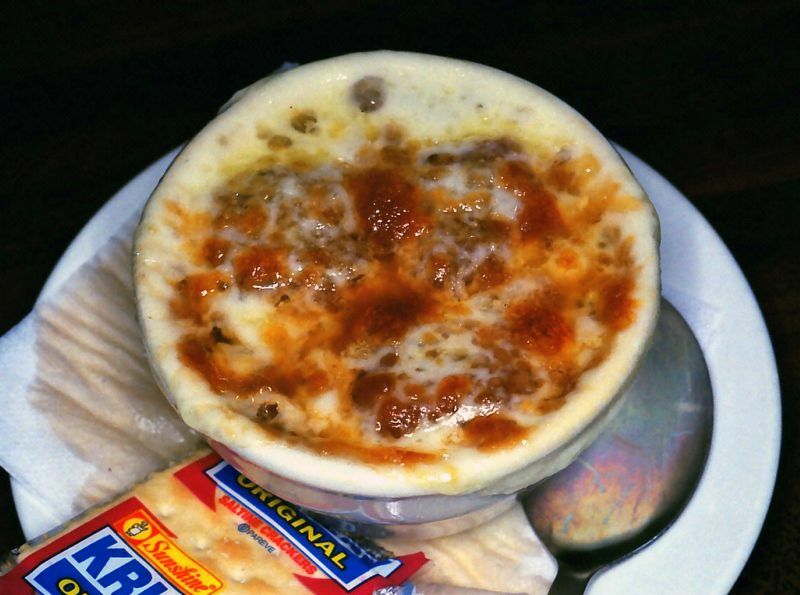 Baked French onion soup isn't a traditional accompaniment to fried chicken but I happen to like it, and Malone's makes a nice version. 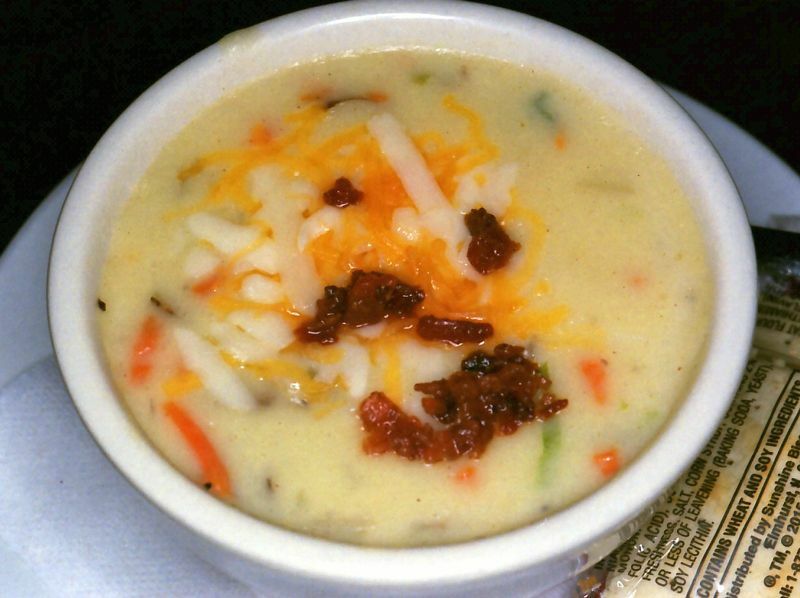 Of course, with a name like Malone's it's no surprise that there's a potato soup on the menu as well. My dining companion pronounced it very good, and it certainly looked rich and creamy. 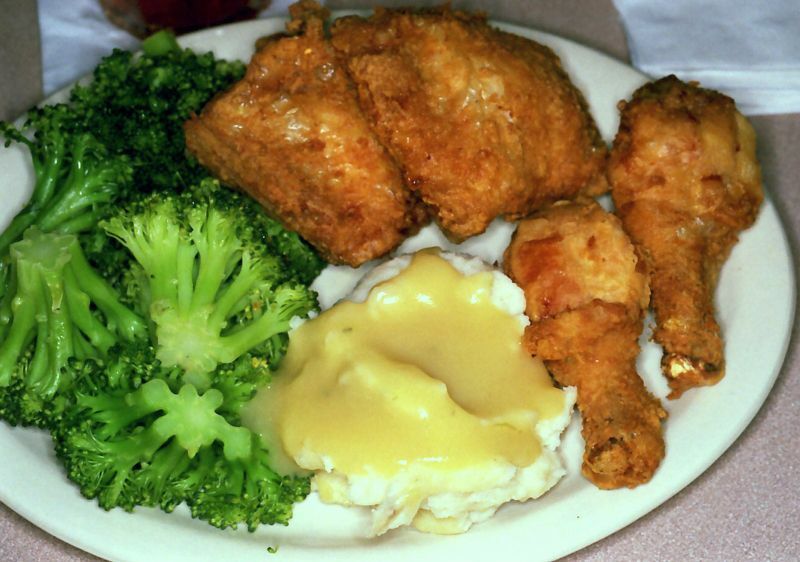 From what I can tell, people who remember Romine's chicken consider Malone's to be a faithful representation of the original article. I thought it was very good, with a fairly delicate flavor and excellent crust. There are a few more places I hope to check out when my St. Louis visits resume next year. The last time I went to St. Louis I decided to avoid the I-55/US-66 corridor for part of the trip, so I exited I-39 at IL-117. As I came into Eureka I noticed The Chanticleer, and while I knew it wouldn't be open I made a note to maybe include a visit as part of one of my future trips. 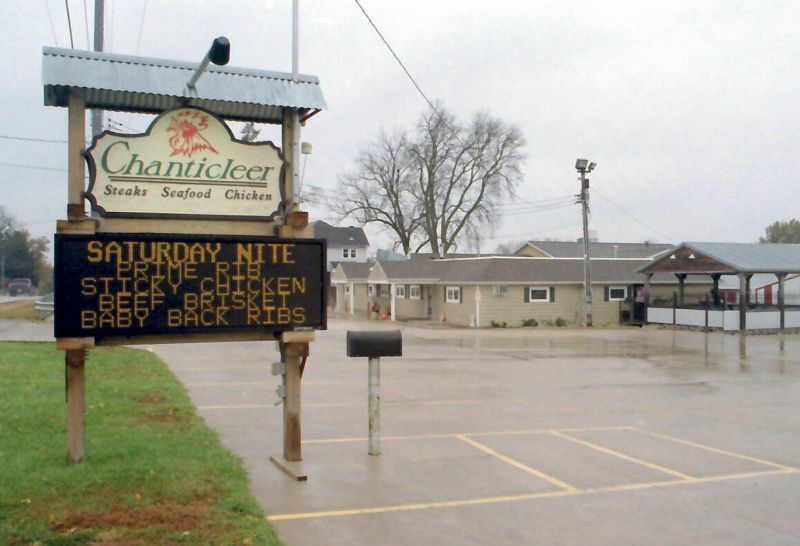 So while The Chanticleer didn't pan out I had higher hopes for my next stop: Busy Corner in Goodfield, at the intersection of 117 and US-150. Unfortunately, at 11am on a Sunday morning Busy Corner lives up to its name and then some, so after taking a peek inside and looking at a packed dining room and lengthy line at the hostess stand I decided to move on. Plus it didn't bother me one bit to miss out on the homemade pies. With Plans A and B not working out it was time to hope that Plan C would be the answer. I headed west on US-150 and south on I-155 to IL-9, where I exited to the town of Tremont. On the west side is a bar & restaurant with one of the more unique names I've run across: Big Art's Yokel. Owned by the same family since 1961, Big Art, Jr. (or would he be Little Art?) and his wife (Laura, I think) welcomed me as I entered as the day's first customer. 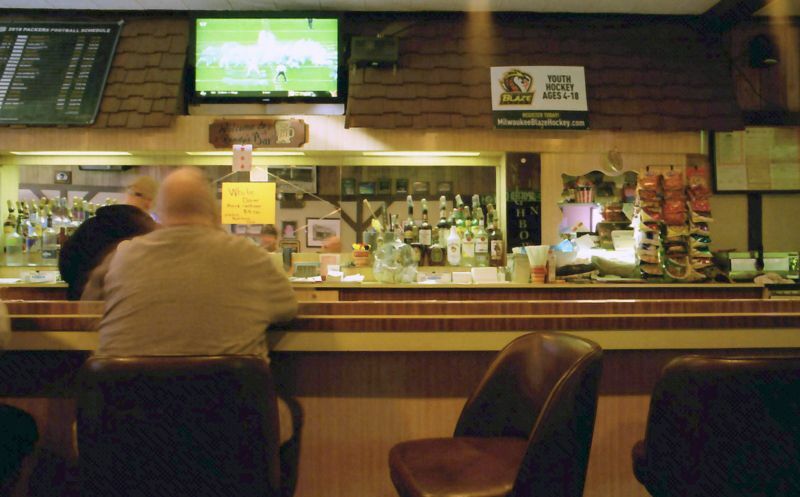 It's not a huge place by any means but there's still plenty of seating at the bar and in the dining room. I don't know if Big Art's does this every Sunday, but the special this day was fried chicken with a side order of lasagna. 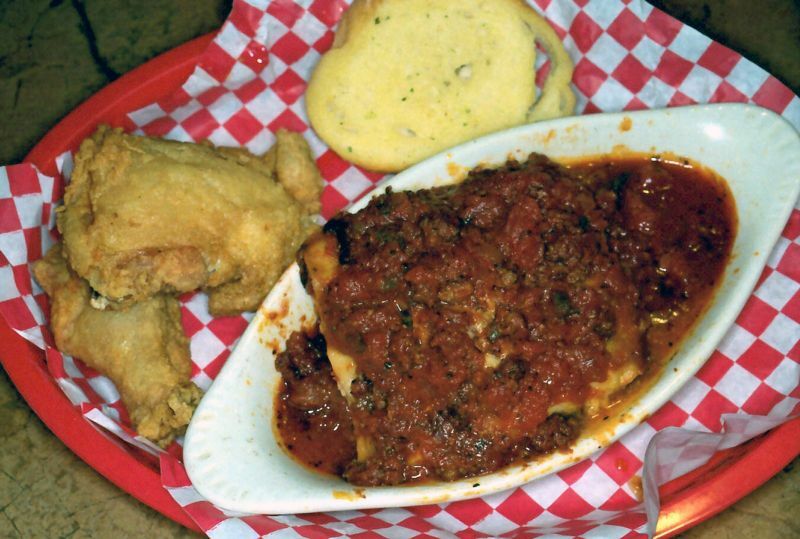 The chicken had a light, crisp crust and good flavor, and I really enjoyed the lasagna with its hearty sauce and layers of ricotta - certainly not what I'd expect to find in a Midwestern small-town bar! This is going to be my next chicken dish. Possibly next week. Chanticleer is solid. Too bad they were closed. Chicken is good. Zucchini bread in the breadbasket top notch. 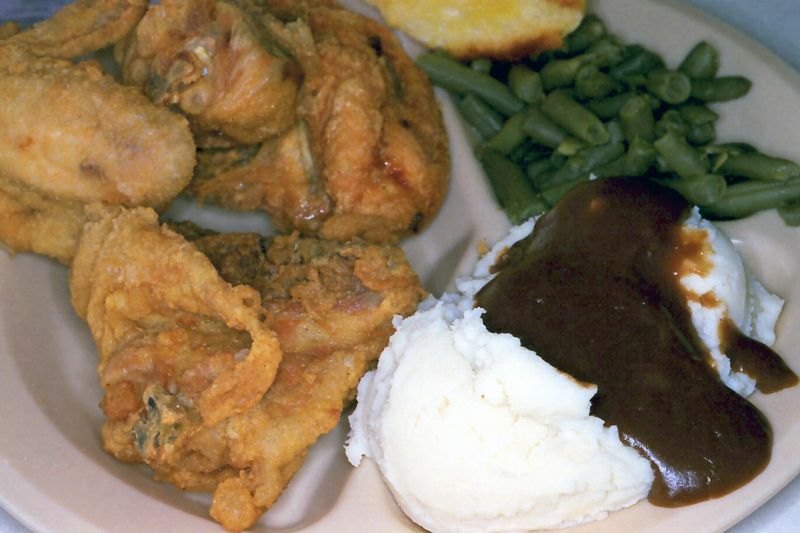 Your getting closer to the fried chicken promised land of Illinois. 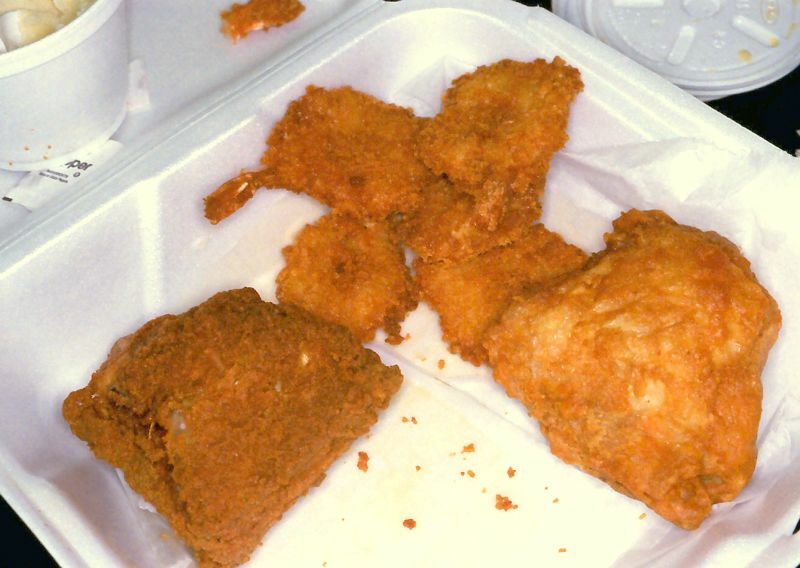 The I 80 corridor through lasalle and bureau counties offer some of the best fried bird I have found. Rips in Ladd, Sip n Snack in Mendota, etc. Unfortunately I'm usually passing through I-80 country fairly early on Sundays when nothing's open yet, or later in the day on Thursdays when I don't feel like stopping and adding more time to my trip home. I need to spend a little time and figure out which places would be practical for a Sunday stop (opening by noon or earlier is a big plus). 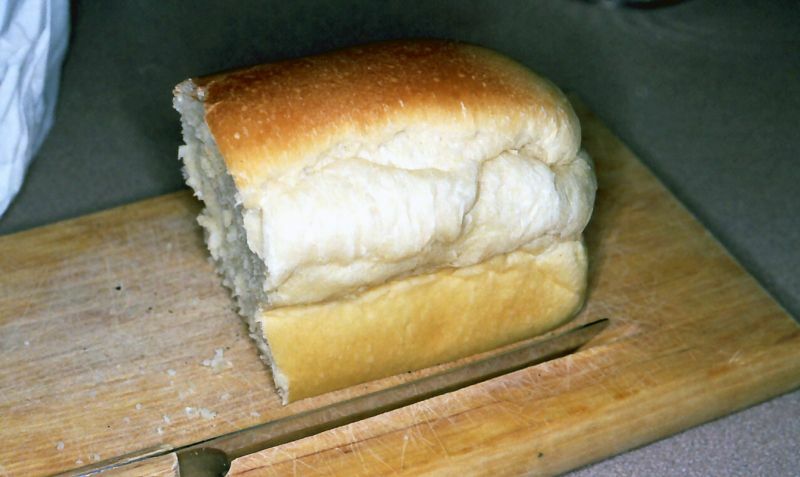 Are you going to compress it all together, bread it, and fry it? It actually looks pretty good; I'll watch for it in the "What's for dinner?" thread. Yes. Going to compress it all together. No, maybe puree it in the food processor first, then bread it and fry it. Or maybe grill it outside in the snow. But I have to pick the rice first. Does rice grow on trees in Ohio? I'll decide next week. Stay tuned. The day after Christmas, to be precise. 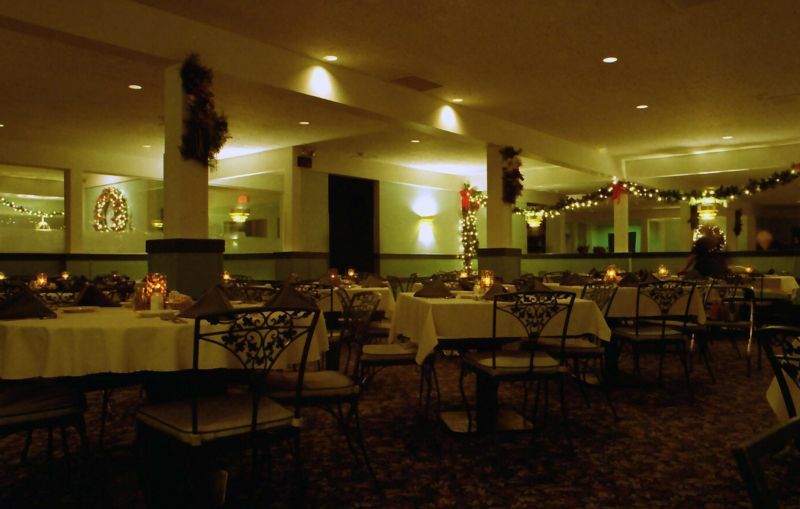 Located outside of Beloit, WI, the Butterfly Club was one of my parents' favorite restaurants for many years and when my brother and were old enough it was a special treat to get to go along. I'll bet it'd been 35 years since I'd eaten there and to be honest I really can't remember very much about it, so I'd been looking forward to a visit for some time. 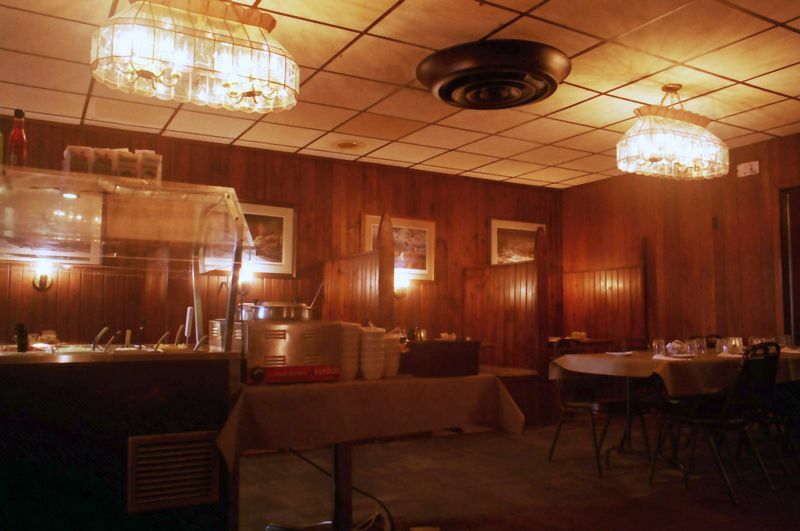 While the interior and furnishings have undoubtedly been updated over the years, the dining rooms still have that old-school feel (my dad always wore a jacket and tie when he and my mom ate here). 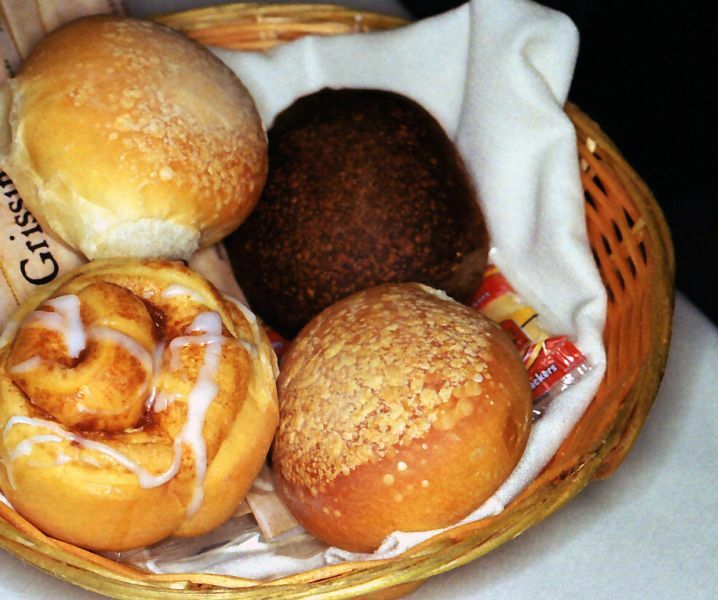 The complementary bread basket includes a homemade cinnamon roll; while it's not something I'd care for I took it home for my wife and she said it was very good. 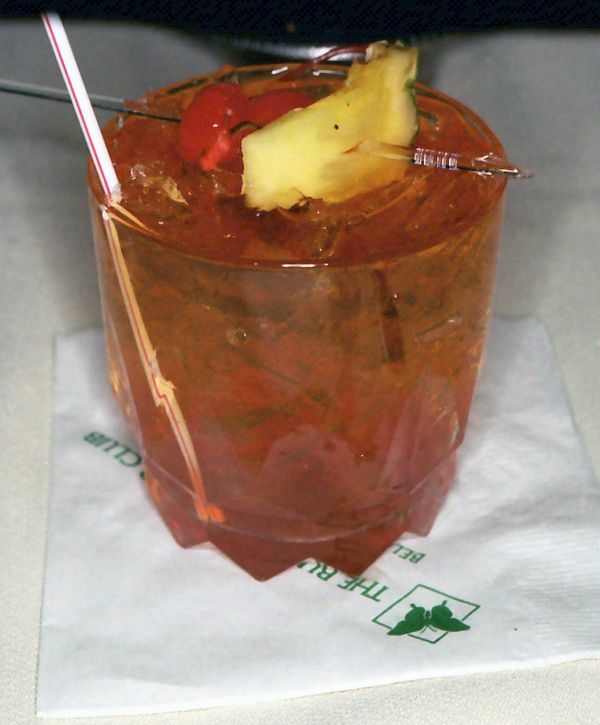 I was very happy with my Old-Fashioned as well. In fact, I tipped the bartender separately on my way out the door. 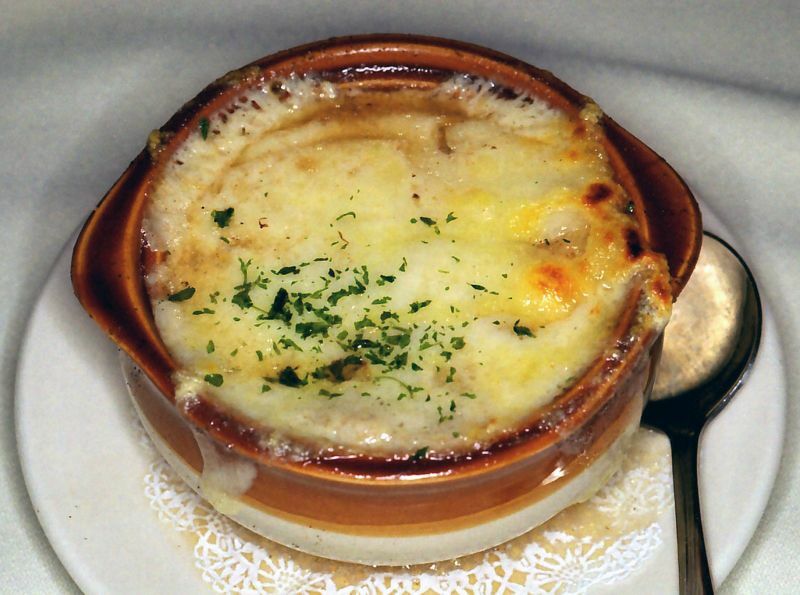 It may have been a quiet Tuesday night and I wasn't having prime rib, but no way was I passing up the excellent French onion soup. It was well-seasoned with a nice onion-to-broth ratio. 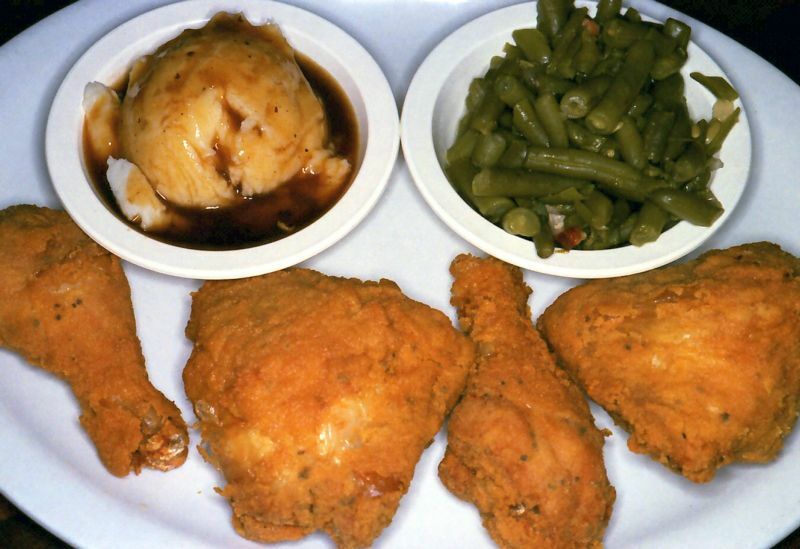 On Tuesdays and Thursdays the Butterfly offers pan-fried chicken for $9.50. It's a simple dinner with just french fries but since it was what I was there for I didn't miss the typical dinner accompaniments at all. I could throw out a bunch of superlatives but I'll just say the chicken was outstanding and leave it at that. Don't you think they could have filled your OF up a little more? BTW, The narrow face looks good. I am loving this thread. I am so obsessed with the taste of chicken and love the delicious food in picture. 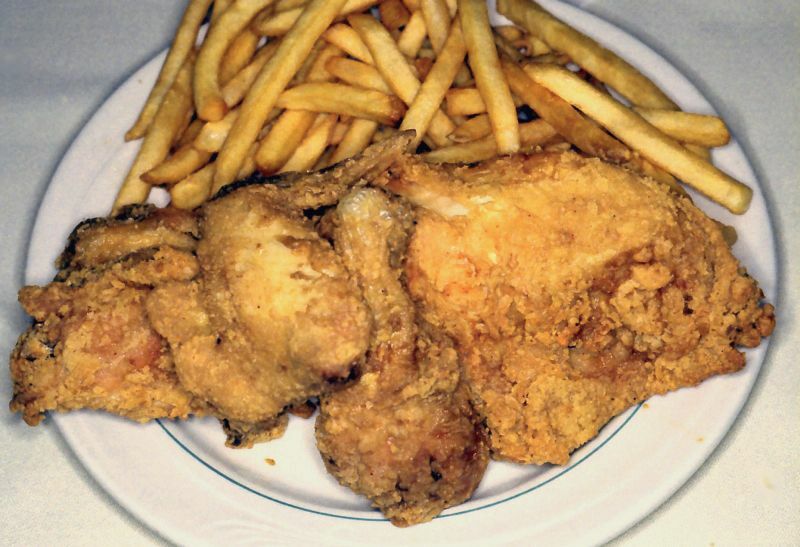 It is a true SE Indiana fried chicken, the skin was crispy and peppery the meat was tender and juicy. 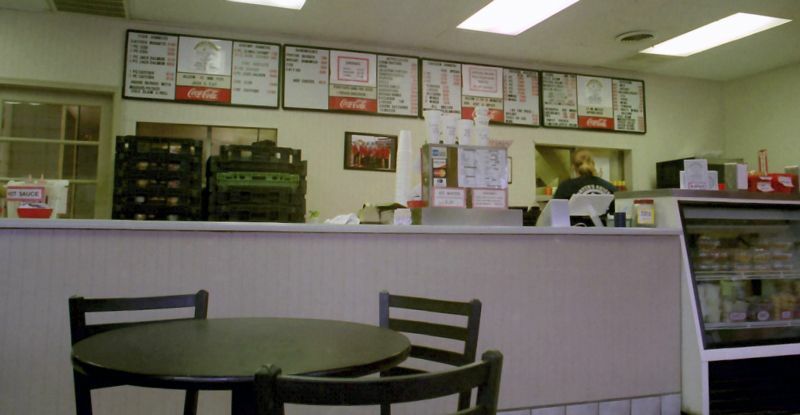 While in St. Louis for work I learned about Dave's Diner, which has locations in Affton, Arnold and High Ridge. It's not a big place but it's tidy and the tables are well-spaced. The server who was working that day was very pleasant and efficient, even though the kitchen was having trouble keeping up with orders. And quite a few of those orders were for chicken. The mashed potatoes and green beans were solid but the chicken was definitely above average. It had a nice, crumbly crust and the meat was moist with good flavor, and even though it took longer than usual to arrive I'd return to Dave's again. Wow, that chicken looks great. Gravy looks like beef gravy. Or food coloring. 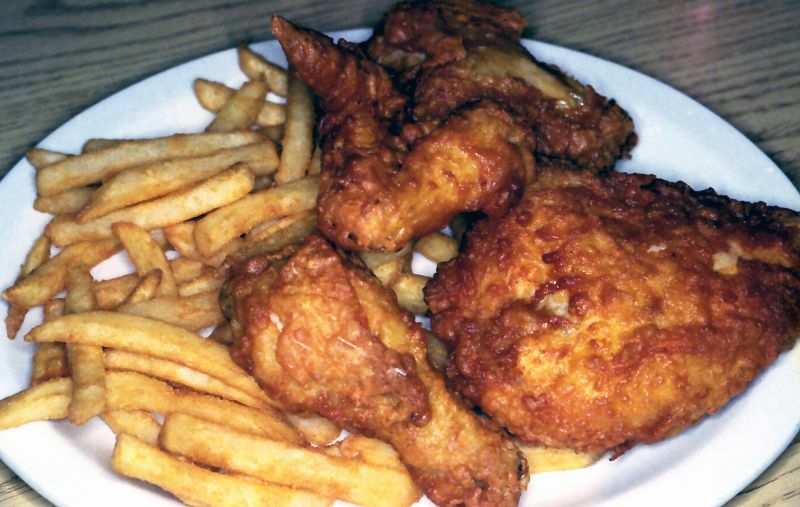 I wish Chicken places would serve chicken gravy. But that's just me. Chicken looks amazing! Maybe YellingHawk is using old Fujifilm. Funny you should mention that...I just sent out some outdated Fuji film for processing and am finishing another roll! I had forgotten it in a friend's freezer probably 4 or 5 years ago and got it back just a month ago. Lee, it was brown/beef gravy. I definitely prefer chicken gravy with chicken but it was still pretty good. Agreed. Chicken gravy would be my preference, but I never say no to a great beef gravy! 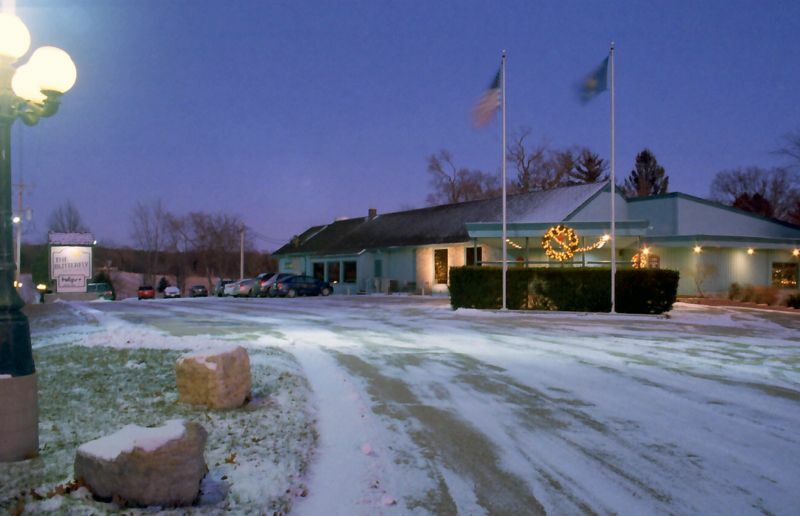 Maple Tree Supper Club has been in McFarland, WI since 1984. To me, a true supper club is a single story (above ground) building. 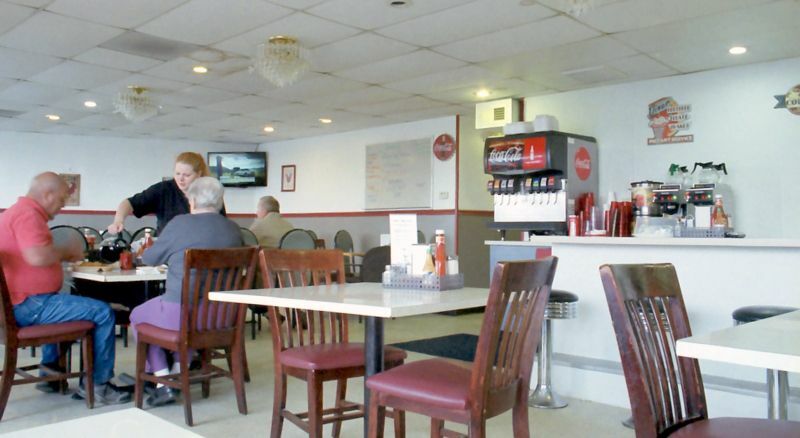 While Maple Tree opened in 1984 the structure itself was first built (it's always been a restaurant) sometime in the mid-1950s, and a little bit of its history is touched on by owner Gary Seiler in this article from 2015. The interior is suitably dark and warmly illuminated. 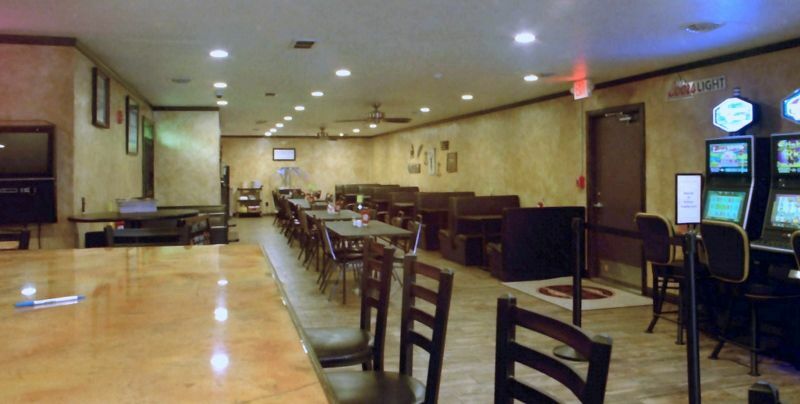 The soup & salad bar isn't overly large but it has most of the traditional items. 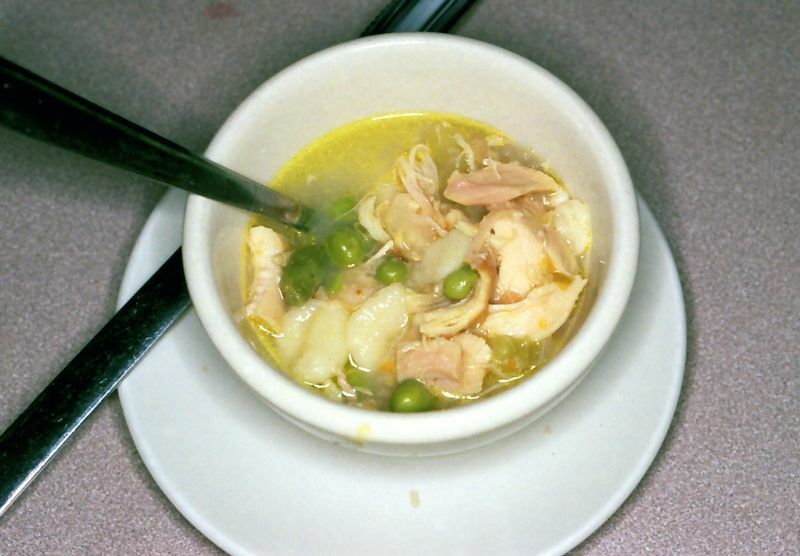 Since I was there for fried chicken I started with a cup of chicken dumpling soup, which was very good. And since it's a serve yourself operation I was able control the ingredients I wanted and the ones I didn't. I could've made a meal of just the soup and bread. This was a very good chicken dinner. Maple Tree uses the broasting process and the meat was tender and juicy, and the crust was nice and crisp. The garlic mashed potatoes weren't too strong and paired nicely with the gravy, and it's a good thing I like broccoli. Two days later I went back for prime rib. 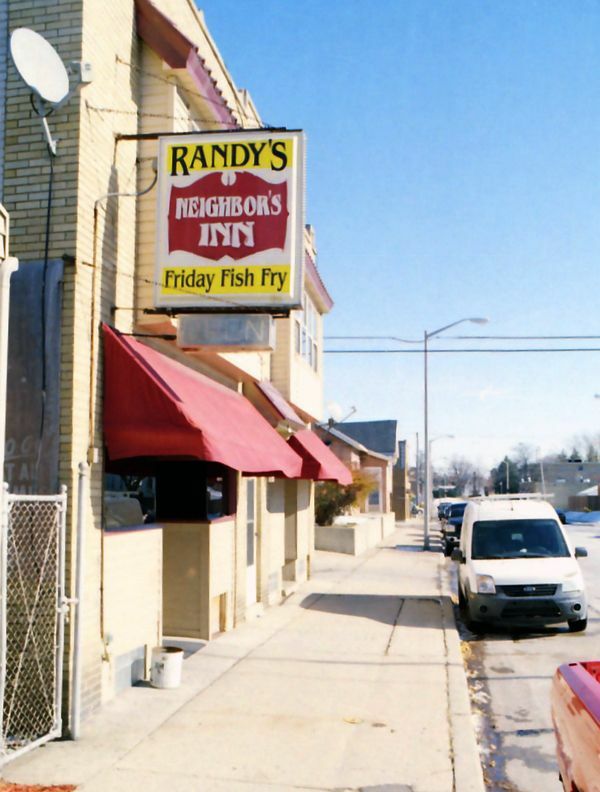 MilwFoodLovers had been suggesting Randy's Neighbor's Inn in West Allis, WI for some time so about 5 weeks ago I finally made the drive. Randy's is definitely a neighborhood watering hole (and illuminated accordingly), but the food is good enough to require reservations on Friday nights. The chicken didn't disappoint. It was ripping hot from the fryer, with a great crust and juicy, tender meat. MFL didn't steer me wrong, and maybe some Friday I'll get a chance to try their fish. I'm glad you enjoyed the chicken. I understand you need to make your fish fry rez by Tuesday. I see quite a few brandy old fashioneds on the dining tables but I doubt if they are muddled. Chicken is the favorite food of mine.